No doubt, congratulations are due! Think about it – you have about as much chance of stopping a runaway freight train with a feather as you do preventing a Jewish mother extolling her son’s success over lunch. Can you blame her? So when skeptics of the many visitations of the Lord’s Mother Mary suggest other than divine origins, we pause and remind them of the initial and eternal union with the Holy Spirit ensuring that all generations will call her “blessed.” We remind the skeptics that Jesus, who existed before time, foresaw His mother before she existed in time. Imagine that. Blessed as Mary is, her message is simple, straightforward and consistent, to paraphrase: “Follow my son Jesus.” Or as Scripture indicates at the wedding feast at Cana, “Do everything he tells you.” None of her visitations seek her own glory, but only that of her Son, the narrow door. Accordingly, if the likes of modern day evangelicals Joel Osteen, Jerry Falwell and the recently departed Billy Graham are universally praised and recognized for bringing the gospel of Jesus Christ to the laity in America, who or what on heaven or earth can or would prevent the Blessed Mother from doing the same and more to the Americas? Can anyone stop a Jewish mother from doing this? This time of year, we reflect on one Marian visitation unique to the western hemisphere and to the Americas – Our Lady of Guadalupe. On Dec. 9, 10 and again on Dec. 12, 1531, Mary asked an Aztec peasant named Juan Diego to bring a request to build a chapel to the Catholic Church’s Archbishop Juan de Zumarraga. 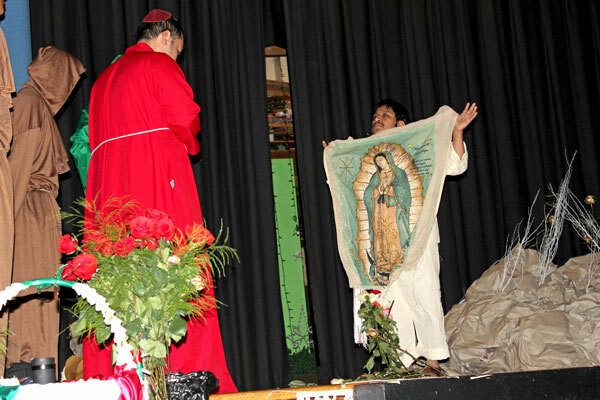 Having little persuasion, Juan Diego was twice denied but was asked by Archbishop Zumarraga to return with some sign indicating he was in fact receiving instruction from the Blessed Mother herself. The impact on the Aztec-Mayan culture of Mexico was profound as a culture of death, practicing human sacrifice to pagan gods by way of living heart removal, was converted to Catholicism. So the sacrifice of native Indian innocents was exchanged for the sacrifice of Jesus in the eucharist. It was clear that what the Spaniards could not do at the point of a conquering sword, the Blessed Mother could do with a painting. One pagan, human-sacrificing, polytheist culture flipped on its head, and turned to the church. The image of Our Lady of Guadalupe is credited with the conversion of an astounding eight to nine million Aztec-Mayans at a critical time, where in Europe four to five million were leaving the Catholic Church during the reformation. The timing here was impeccable, ensuring a replenished church laity in the west as the east retrenched. There are many miracles both of and related to the tilma that are worth researching. We acknowledge no other “artwork” known to mankind has been credited with the conversion to Jesus Christ of such vast numbers in so short a period of time. Joel Osteen, Jerry Falwell and Billy Graham, combined, would be happy to have numbers like that. So as we gear up for Christmas, it may be a good idea to pause, reflect, pray and celebrate with some flowers and a Spanish-Mexican meal on Dec. 12, recognizing Mary’s loving evangelization and most notably, her faith in our heavenly Father in giving us her Son. Here we honor and respect one particular Jewish mother in history who will not be denied the power and freedom of the Holy Spirit in guidance to her Son. Perhaps now is the time for the Americas to revisit the Blessed Mother’s message as it applies to this “culture of death” society, that we may share in the Aztec-Mayan conversion one day soon. The Lamb of God is returning as the Lion of Judah, are ye prepared? McLaughlin’s grandfather, uncle and father owned and worked with the McLaughlin Trucking & Distribution Company of Brooklyn delivering The Tablet from the 1920s to the early 1940s. He resides in Garden City, L.I.